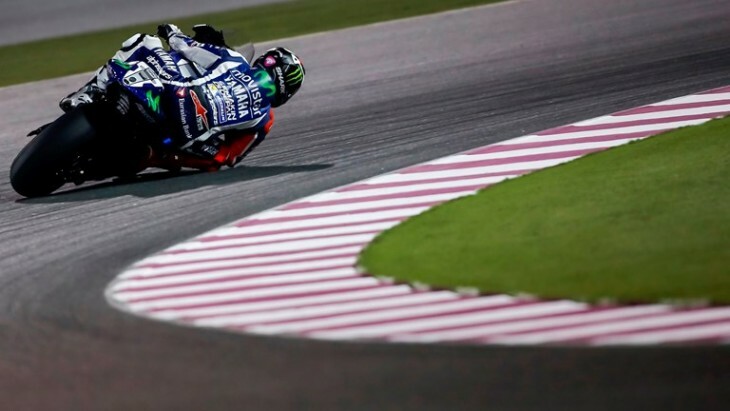 Movistar Yamaha MotoGP’s Jorge Lorenzo and Valentino Rossi completed the second of the three days of testing in Qatar today that mark the final official test of the 2016 MotoGP pre-season schedule. The teammates once again put in long hours as they diligently worked on the settings of their bikes and finished the day in third and eighth place respectively. Movistar Yamaha MotoGP riders Jorge Lorenzo and Valentino Rossi were again out on the Losail International circuit in Qatar, putting their 2016 YZR-M1 machines to the test as they continued to look for the ideal balance to use the new Michelin tyres and the new electronics to the fullest. Despite the dirt gradually clearing from the track, Lorenzo struggled to find traction during today’s session, though this barely slowed him down. He impressed by setting a fastest lap early on before continuing his hunt for the perfect set up. He completed the second day with a 1’55.535s lap for third position, less than a tenth of a second from today’s fastest time. Teammate Rossi was the first rider to head out on track today and quickly moved to the top of the time sheets. He then turned his focus to testing some new items. As the restrictive tyre allocation didn’t allow him to do a time attack, he was unable to improve on his best time from yesterday. The Italian settled for eighth position with a fastest lap of 1’55.947s, a little more than half a second from today’s leader. Tomorrow will be the final day of testing for the Movistar Yamaha MotoGP team before the start of the MotoGP season. The crew and riders are looking forward to returning to action and is delighted it will defend its MotoGP Triple Crown with the support from, as of today, more than two million Facebook fans on its official page, facebook.com/yamahamotogp. Monster Yamaha Tech3 team riders Pol Espargaro and Bradley Smith pushed on and continued their preseason work in the penultimate day of testing in Qatar. The pair carried on refining their Yamaha YZR-M1 MotoGP bikes in preparation for the all important 2016 season opener, where they aim to battle for the leading satellite position. Pol Espargaro stepped his efforts up today and produced a lap that was over half a second quicker than his personal best from yesterday, whilst the overall top time was not lowered significantly. This was despite suffering with a crash at turn 15 that fortunately did not injure him, yet his progress today leaves him confident of advancing further tomorrow. Meanwhile, Bradley Smith wisely decided to preserve his tyres for the final session, where he will attack at full speed. His time of 1’56.517 from yesterday leaves him in 14th in the combined standings and tomorrow he aims to close his preseason campaign strongly.